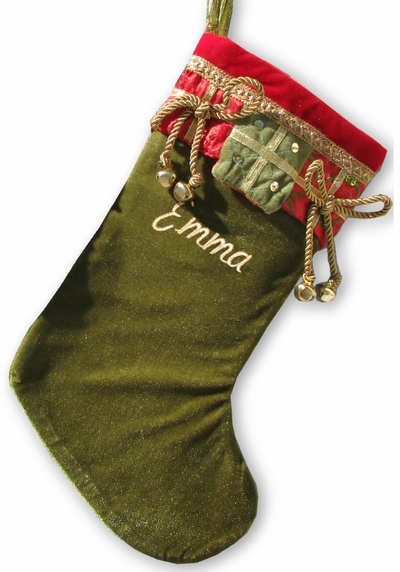 This Jingle Bells Velvet Christmas stocking looks gorgeous personalized! It has real jingle bells and it is personalized or monogrammed in high end Christmas embroidery in festive metallic monogram thread. Measured along the diagonal from the top left hand corner to the toe, the stocking measures 19 inches, and the width along the cuff is 7.5 inches. These are REALLY WELL MADE HEIRLOOM QUALITY stockings with real jingle bells, you will be pleased to own them! Materials: The stocking is made from red and green, gols polyester velvets and metallic rope. Lining: No, this stocking is lined inside with satin inlay.